Engage your students with these colorful Google Slides as they produce a research report on reptiles. 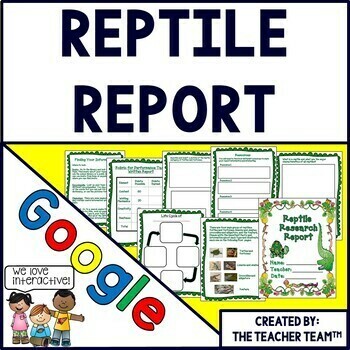 This Google Classroom digital resource contains a complete paperless Reptile Research report. Perfect for Chromebooks, HP Streams, and other devices in a 1:1 classroom. Printable version included! This resource uses file sharing with Google or Microsoft OneDrive. Use these activities to engage students in a whole class, small group, or independent environment. This resource is also perfect for home school students. 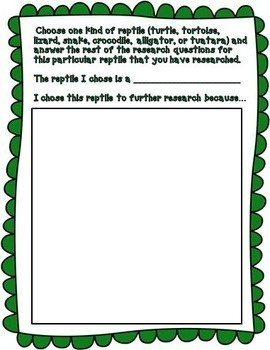 Templates are included to create, develop, write, edit, present, and assess your students’ Reptile Report. This report (or performance task) is also designed to not only to learn and explain the new information, but answer some higher level thinking questions (Common Core Essential Questions). Our product is designed to assess and show what your students have learned and share it with you, their parents, and perhaps the class if you’d like them to present it. A printable version of this report is also included in this product! A simple rubric and student checklist is included. 1. What is a reptile and what are the major characteristics of all reptiles? 2. There are four major types or categories of reptiles. Please write the important facts and information about each type and illustrate each one. 3. Choose one kind of reptile (turtle, tortoise, lizard, snake, crocodile, alligator, or tuatara) and answer the rest of the research questions for this particular reptile that you have researched. State the reptile in which the student chose and answer why they chose it. 4. Describe each part of your reptile’s anatomy, Describe its size, colors, and any other characteristics of its appearance. 5. How does your reptile protect itself? Does it use camouflage? 6. How does your reptile travel from place to place? 7. Describe the typical diet your reptile. What are the predators and prey of your reptile? Where is this reptile in the food chain or food web? 8. How does your reptile get its oxygen to live? 9. Describe typical habitat or habitats of your reptile. 10. Illustrate your reptile’s habitat. 11. 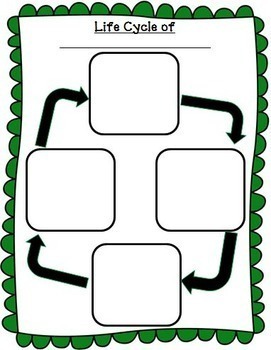 Label and illustrate the life cycle of your reptile. 12. What is an average lifespan of your reptile and what variables can affect its lifespan? 13. Is your reptile endangered? Are there threats to its survival? If your reptile is not endangered why? 14. How long has your reptile existed on earth? Is there any fossil evidence to prove when it began to exist? 15. Compare and contrast your reptile with another reptile that interests you and write about their similarities and differences. 16. Is your reptile considered harmful or helpful? 17. What are some interesting or unusual facts about your reptile? 18. Some studies have shown that reptiles are growing in popularity. Why do you think this trend is happening? 19. 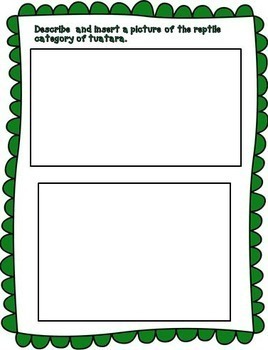 Blank page to add to any of the questions if more room is needed. 20. Additional Information page for any other facts not discussed in other areas of the report if needed. 21. A page to help your students find information for their report. 22. Resource Page and Bibliography Template- I use the Resource Page template because my students are not ready to learn the rules of a true bibliography, but if you teach bibliography skills I have included a template for you. 23. Note Taking page for students to take notes as they gather their research. 26. Report Checklist for students to check if all performance tasks are completed and included. 27. Editing and Revising Checklist. DISCLAIMER: These materials were prepared by The Teacher Team and have neither been developed, reviewed, nor endorsed by Google.